Elton John and partner David Furnish are planning to marry now that gay marriage is legal in England. 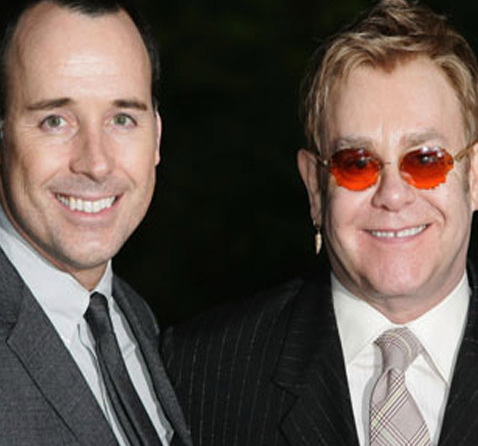 Elton John and David Furnish are heading to the altar in just a couple of months. The legendary singer and his partner will marry in an English registry office in May, Furnish told the Las Vegas Review Journal Friday at John's birthday party at Fizz Las Vegas (which the crooner created) in Caesars Palace. The couple already entered into a British civil partnership eight years ago, throwing a big bash at their home in London to celebrate at the time. But, given that Friday marked the first day gays were allowed to tie the knot in England, they've decided to say "I Do" once again. "We don't feel the need to take an extra step legally," Furnish said. "But since we're committed for life, we feel it's really important to take that step, and take advantage of that amazing change in legislation. We all live by example." Good for them, they have more than earned the right to equality and they have been together a lot longer than most of the other celebrity married couples, and will not doubt raise more well adjusted kids than their famous counterpart asshats. Elton has raised billions for Aids and has donated millions to charity as a human being he's a stellar guy in my book. I also hope their is a book dishing dirt on all the fuckery he's been wanting to say, upon his death of course spill those beans Elton!! !